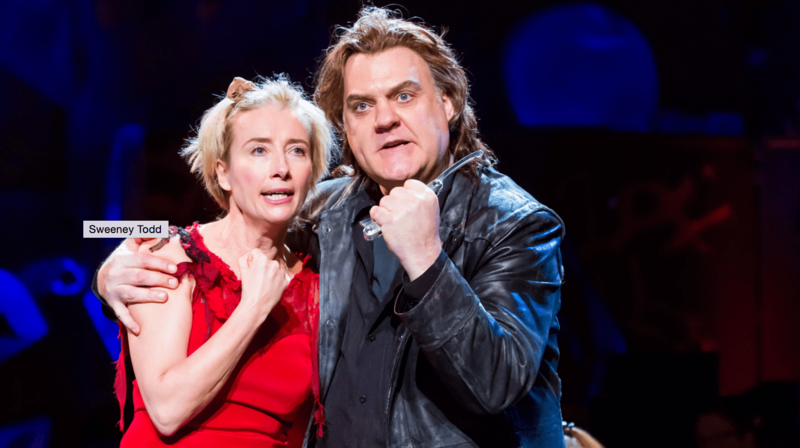 Following their acclaimed performances at New York’s Lincoln Centre, Bryn Terfel and Emma Thompson brought their portrayals of Sondheim’s infamous ‘demon barber’ and unscrupulous pie-maker across the Atlantic to another sold-out run at the English National Opera. This production echoed the Lincoln Centre’s concert format, placing the orchestra on stage in the middle of the action and employing instruments as props – the pie counter was a huge drum, the meat grinder a trombone, and Sweeney’s first barber’s chair a stool cheekily stolen from a bassist. The ENO’s staging, however, was more theatrical; even though the stage was limited to a strip at the front, another at the back, and a platform in the centre (all connected by walkways), it proved ample space for the grotesque bloodbath to unfold. And while the actors began the show as if it were a concert, by the end of the prologue costumes had been donned, the piano flipped upside down and dismantled, and the backdrop revealed as antiestablishment graffiti. It was an electrifying opening which grabbed the audience’s full attention, never letting them relax until the final note had sounded. And what notes those were. The orchestra handled Sondheim’s nuances and complexity with ease and grace; the only jarring notes were those deliberate ones from the horns, which announced every brutal murder with equal aural brutality. Since there was an orchestra onstage, there was already an element of the surreal in the show. This made the minimal, abstract set and props very appropriate. Some objects, such as pies, were completely mimed, adding an element of make-believe which fit the outrageous drama (and perhaps making the gleaming razors hyper-realistic). This is not to say that the performance relied on shock or melodrama; quite the contrary, its heart was the strong vocal and dramatic performances. As Sweeney, Terfel did not need to do much to draw the audience’s attention. His deep, mellifluous yet menacing voice combined with his impressive height and broad shoulders immediately drew the ear and eye. His was a deliberate, determined Sweeney, brooding and grim until those moments when unbridled feeling broke through, making the character’s journey immediate and believable. Emma Thompson, making her first theatrical appearance in twenty-five years, held her own against her partner despite her lack of musical theatre training (the only signs of struggle were in ‘The Worst Pies in London’, which is relentless high for a mezzo soprano). Her Mrs Lovett was flawlessly funny because she let her no-nonsense actions speak for themselves. Her comic timing was effortlessly sharp and her exaggerated accent and physicality just the right level of caricature. The rest of the cast were fabulous. Philip Quast was a dignified, remorseless, and smooth-voiced Judge Turpin; Matthew Seadon-Young a sweet Anthony in voice and manner; and Katie Hall a spunky, angel-toned Johanna. Jack North sung Tobias as a tenor, but his youthful appearance made the choice work. Alex Gaumond was a obsequious Beadle Bamford, and the great John Owen-Jones a pompous Pirelli. Lastly, Rosalie Craig never let the Beggar Woman slip into shrill insanity, instead keeping her rich tones coherent despite their plaintiveness – a choice which kept the audience sympathetic instead of disgusted. There is no doubt that this production had few – if any – weak links. The English National Opera may have a tricky time following this unbridled success in future seasons.